Afterwards, we looked up Zophia N. as recommended by Władislawa. 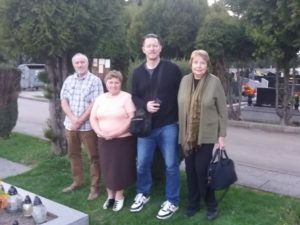 Zbigniew took us to her house. When she saw a photo of my grandmother’s brother, Jósef, she said….”That’s my grandfather!” We learned that Jósef Korycinski lived in the United States for several years with my grandmother and their sister. He worked and was sending back money to family in Poland. He returned to Poland and lived with Zophia N.’s grandmother and helped to raise and support Zophia’s mother and uncle. 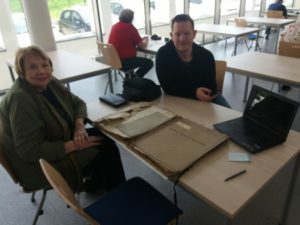 She told us that almost 50 years ago, some relatives did visit, but that was the last contact from any U.S. family other than an occasional letter or package that have long since stopped coming. These relatives were my mother’s cousins. All of these people died years ago. Zophia N. was very helpful and told us we had a relative, an elderly bedridden woman who was a Koryciński and lived nearby. She offered to take us to her house. We drove over with her and when we knocked on the door, a woman greeted us and crossed her arms over her chest in amazement and deep emotion. Her name is Ewa and she told us that she had been talking with her mother just the past week about relatives in the U.S. and if they remembered their Polish family and practiced any of the Polish customs. 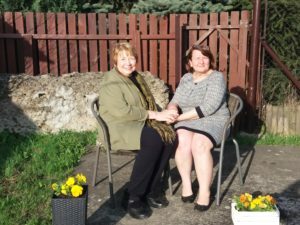 Ewa invited us in and we met Zophia K., a delicate and fragile elderly woman who despite her physical weakness was quite animated and talkative. Knowing her name now, Alex and I had a sudden realization that one of the few letters we randomly selected several months ago to be translated, that we had gotten the name of the village from, was likely one written by Zophia K. to my mother. Alex had copies of the letters on his Ipad. He opened the letter and we discovered that Zophia K. was just 11 years old when she wrote the letter to my mother. It turned out that Zophia K. is my mother’s cousin, her father Antoni was my grandmother’s brother who died at Auschwitz. She had written the letter soon after her father had died, to thank my mother for a package that she had sent. It was an overwhelming moment and there were many tears and hugs. 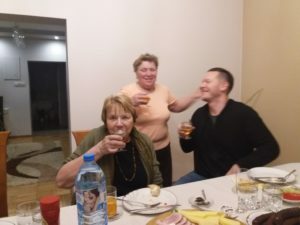 We connected with 3 generations of cousins in that house: Zophia K., her daughter Ewa, and grandchildren Monika and Łukasz. We visited with our cousins for a little longer, took photos, and exchanged mailing and email addresses. It was time though to go back to the church to meet with the priest again. We did that and we were able to find out much more about my grandmother’s ancestry. Zophia N. joined us afterwards at the church cemetery. She knew where the graves of our relatives were located and helped us where we weren’t successful the day before. Zophia N. also invited us over for dinner at her home. Her husband and brother joined us and it was a wonderful dinner and celebration of our visit. 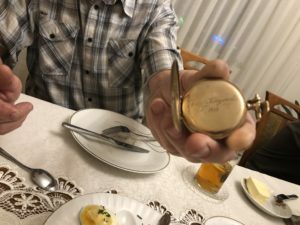 Zophia’s brother showed us the engraved gold watch that his “grandfather”, my great uncle, Jósef had given him years ago. We took more pictures and drank more vodka and had a great time. The amazing thing is that the discoveries and meetings of those two days were all unexpected. We truly felt blessed because everything went in our favor and to our advantage. Zbigniew’s talent and skills and perhaps a little divine intervention came together for a wonderful and memorable experience. 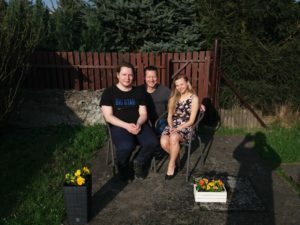 Our vacation was almost over, but we had one more day to explore the countryside and see what we could find out about another branch of the family. My husband Tom’s maternal grandmother’s family was from Borki Nizińskie, a village to the east of Kraków. Because we did not travel to Zakopane the day before, we missed seeing the wooden church marvels on the way. But, as it turned out, we discovered THE wooden church in Borki Nizińskie. It was unbelievable….built in the early 1600’s, it turned out to be a historic church supported by the Polish government and European Union. The church grounds and the church were in pristine condition. A busy group of parishioners was working trimming trees and bushes and manicuring the grounds to perfection. We were able to tour the beautifully ornate church and see where my husband’s ancestors attended religious services. On Saturday, we traveled back to Kraków. We relaxed and enjoyed the market square restaurants and shops. This was a trip of a lifetime for me in many ways. With my ancestry being 100% Polish, I always imagined what it might be like to walk on the same ground and be in the same surroundings of my ancestors. For me, I really felt at home. I felt like I belonged. It was a comforting feeling. 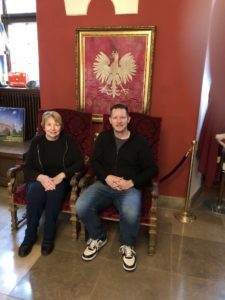 I am deeply thankful to my son, Alex for taking me on this trip and to PolishOrigins and staff, especially Zbigniew, for making this a dream come true. This entry was posted on Friday, August 3rd, 2018 at 11:04 am and is filed under From Michigan to Poland. You can follow any responses to this entry through the RSS 2.0 feed. You can leave a response, or trackback from your own site.